Black anodized aluminum. 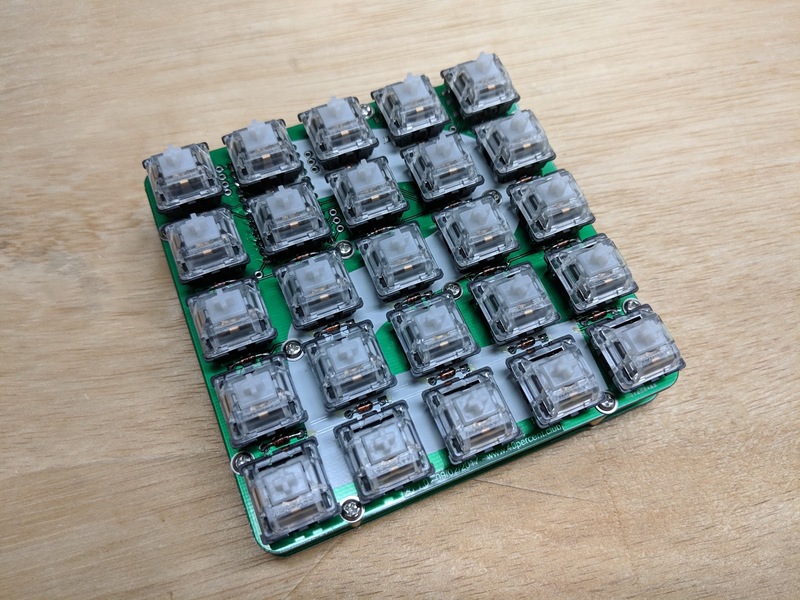 Designed to fit the Gherkin PCB without any plates. 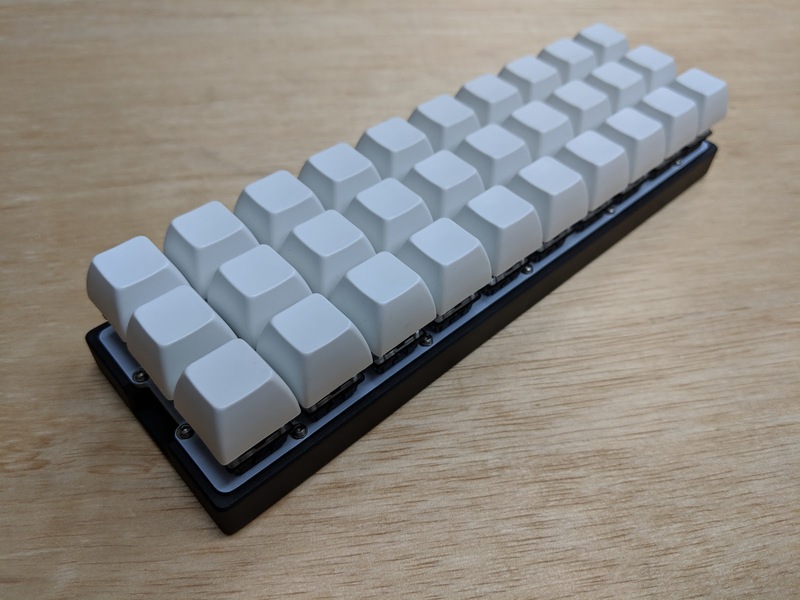 Blank white PBT SA keycaps. 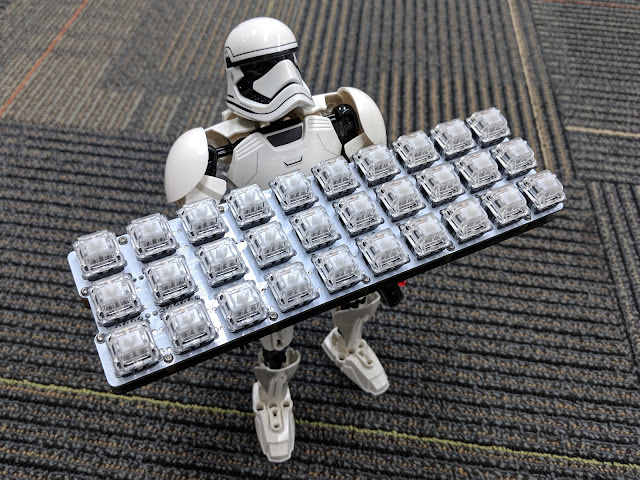 Blank white PCB. I got one of these keys from Amazon. They are used for 2 factor security with websites like Google and Github. There are many different styles of these keys. Some look like little USB thumb drives. 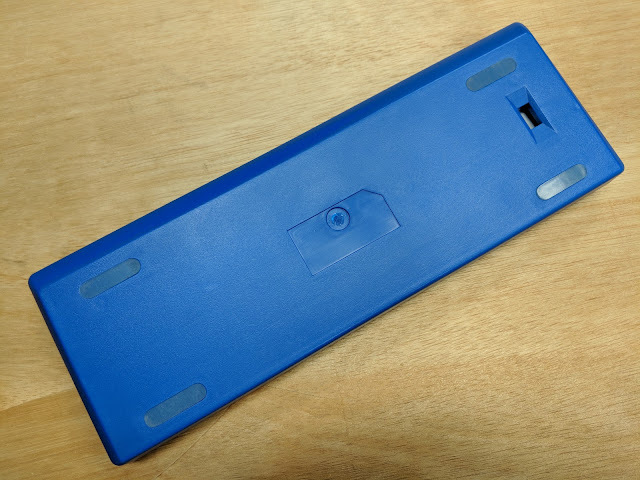 Others like the Yubico or Feitian are plastic encapsulated. This one is a bare PCB with a physical switch. The U2F Zero is a single purpose keyboard with one key switch. It uses the USB HID protocol and has an RGB LED. It's also one of the cheapest U2F keys available. The U2F Zero is an opensource project hosted on Github. I also have Yubikey NEO and Feitian NFC keys. These can be used with an Android phone to do U2F authentication via NFC. There are currently few applications that use them on a phone. Another plateless Gherkin. This time with POS keycaps. 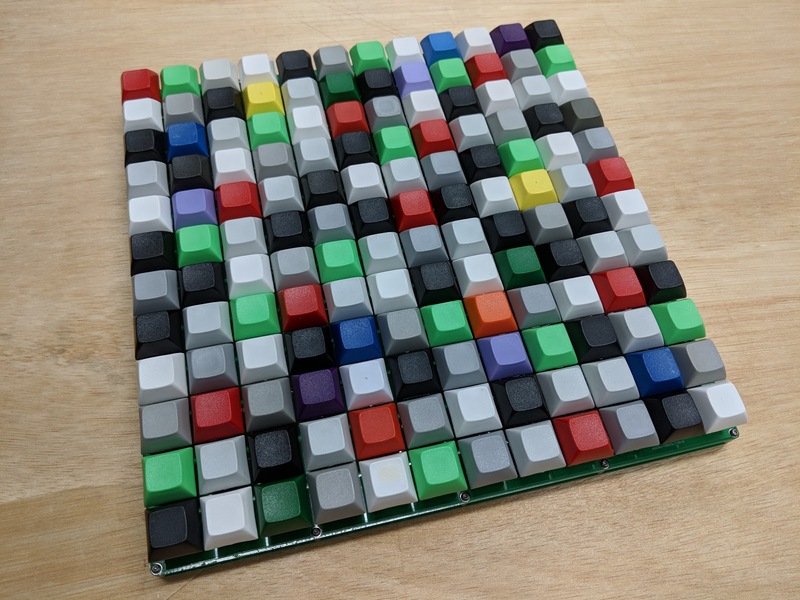 These are keycaps made for cash registers. 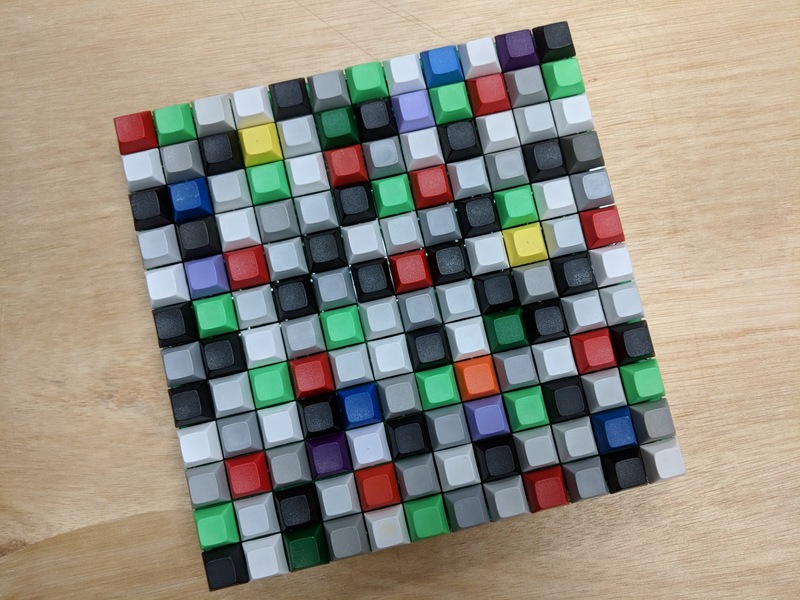 Each keycap covers more than one switch, there are no stabilizers. These came from PMK grab bags. They are all DSA profile, I also have some in DCS and SA profile. PMK sells blanks on their website. 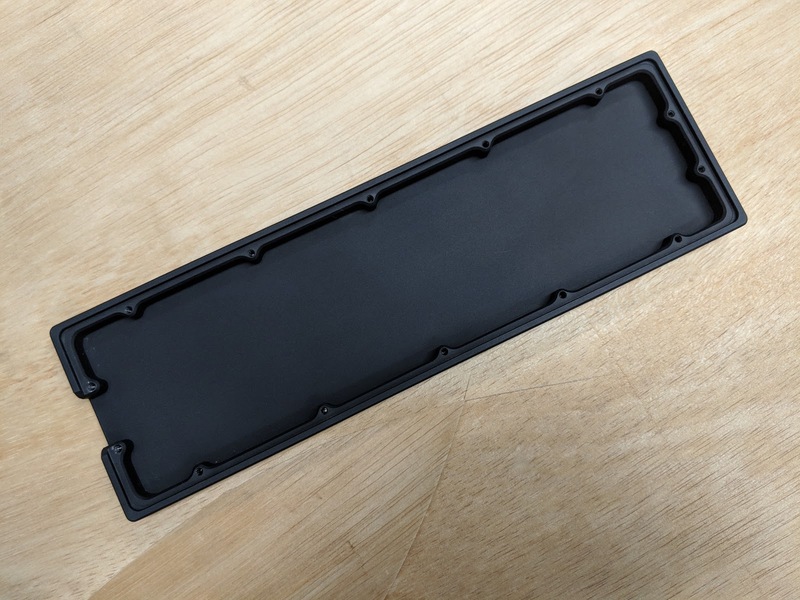 Similar relegendable POS keycaps are sold by X-Keys and Genovation. 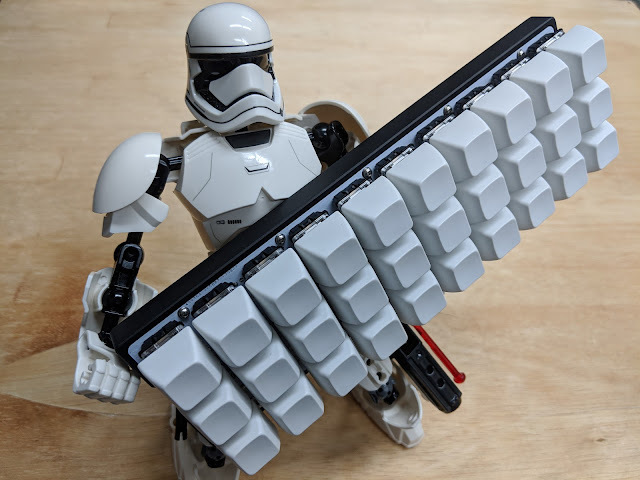 Not a keyboard, but made with many of the same parts. Other than the LEDs and PCB, the rest of the parts I already had. The PCBs were made a while ago but I only finished assembling it this weekend. 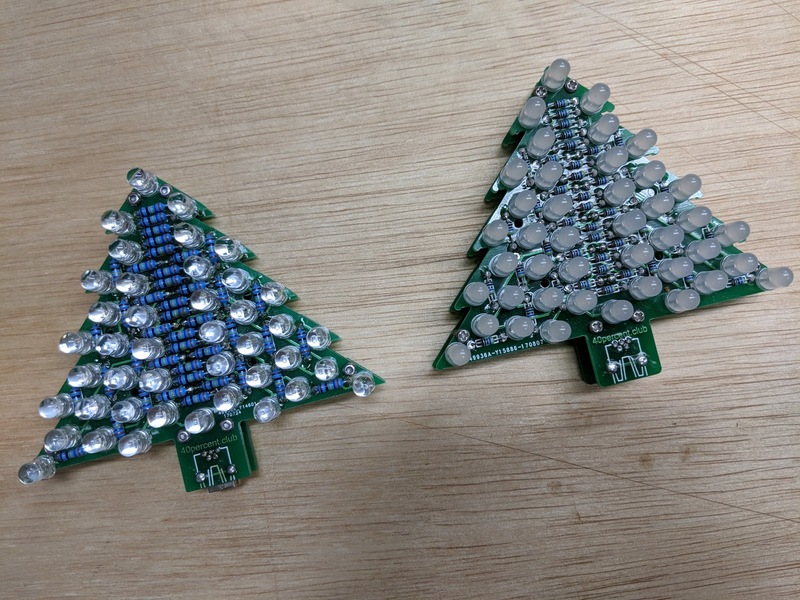 The first PCB version had sharp corners and was too dangerous to put on a tree. 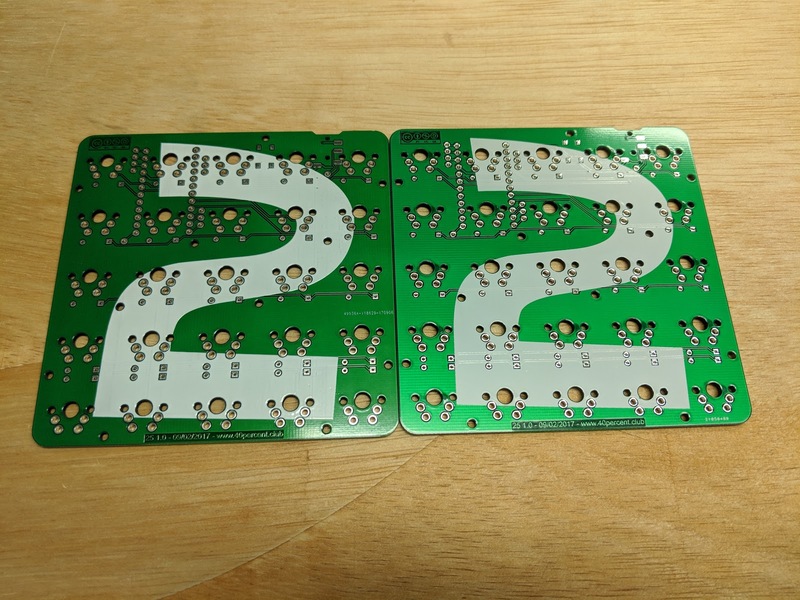 I rounded the corners and had another set of PCBs made. These are under 100x100mm and can be made at most places at a discount. I used self flashing LEDs. I ordered some 5mm green/red flashing LEDs on eBay. They were supposed to be diffused (milky white), but they sent clear LEDs. These are way too bright and directional. The replacements they sent were also clear. So I ordered some 5mm RGB diffused flashing LEDs from another seller. 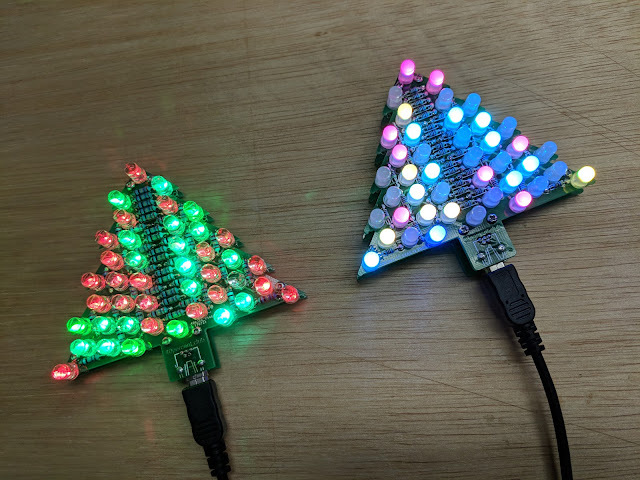 The green/red does look more like Christmas tree lights. There are holes for M2 spacers. 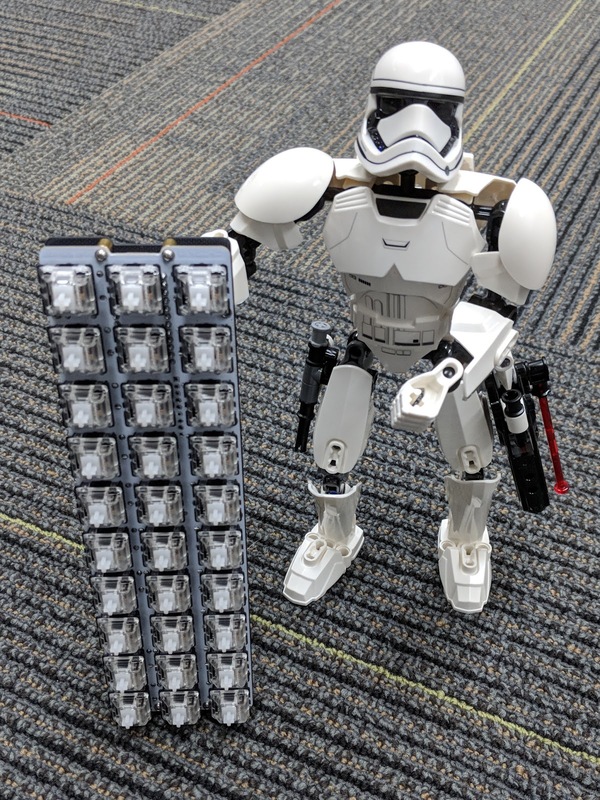 Some are too close to the resistors to fit. But there are enough to hold two PCBs together securely. 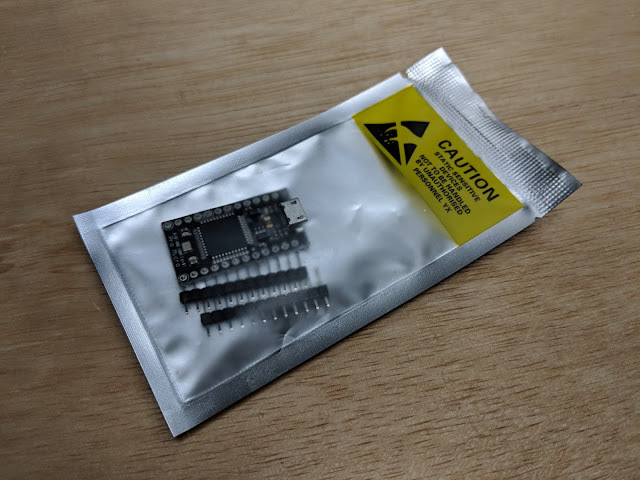 The board is powered from a mini USB connector. First version on the left, rounded corner version on the right. 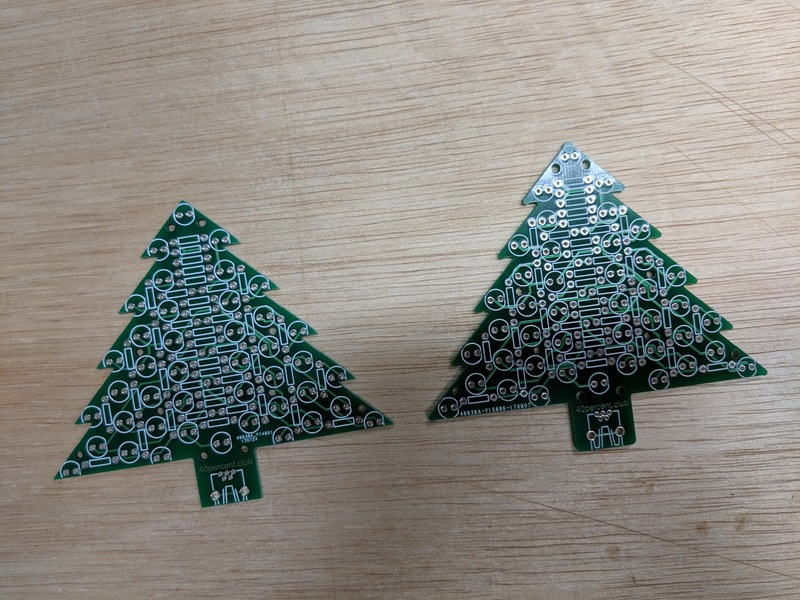 The bare PCBs. You can see how sharp the corners were on the original PCB. I used 1/4 watt resistors on the first one. They fit but the LEDs would not fit in some spots, I had to grind a bit off the edges. 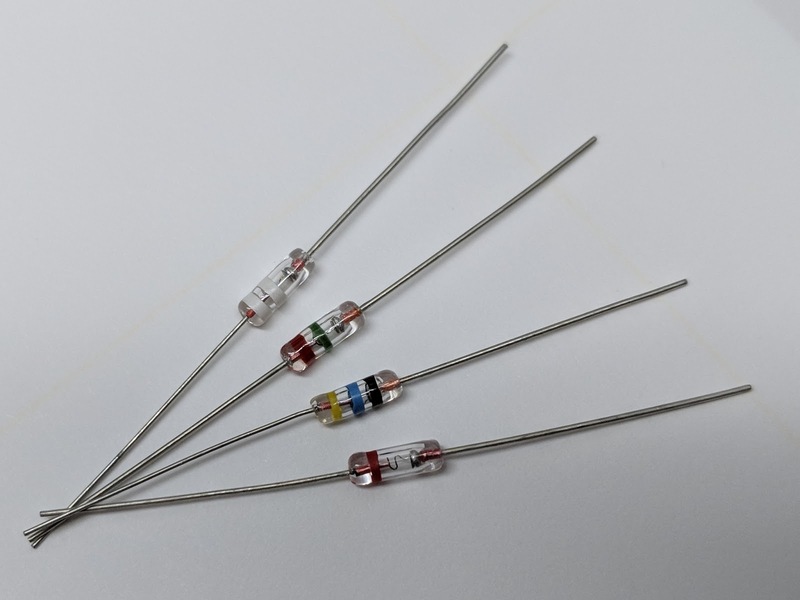 The 1/8 watt resistors on the second one don't interfered with the 5mm LEDs. 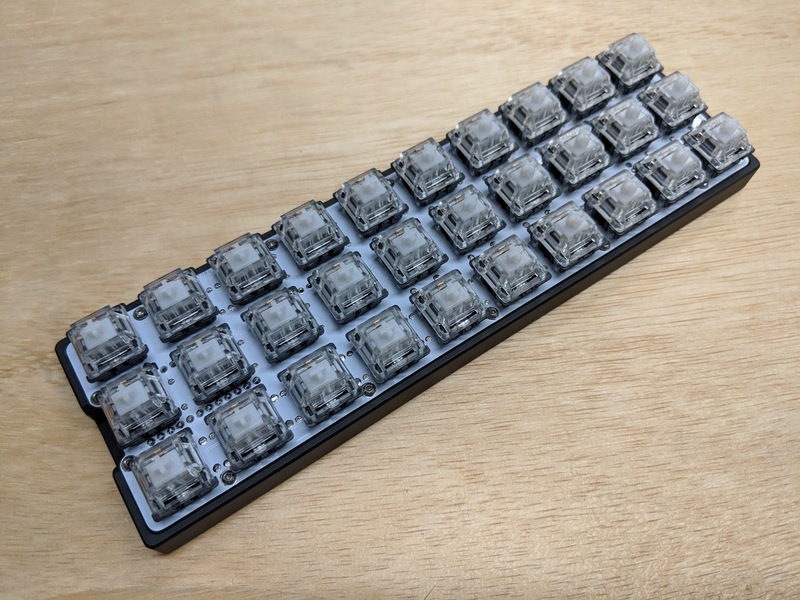 Gherkin with blank (no legends) white PCB. The bottom is a sanded and dyed black PCB. 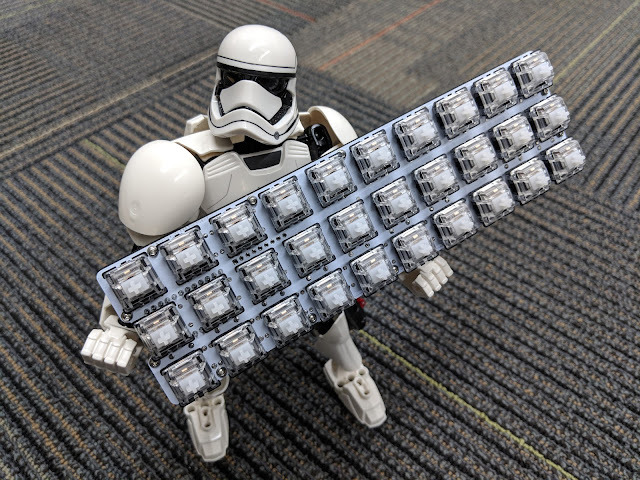 Gateron clear linear switches. 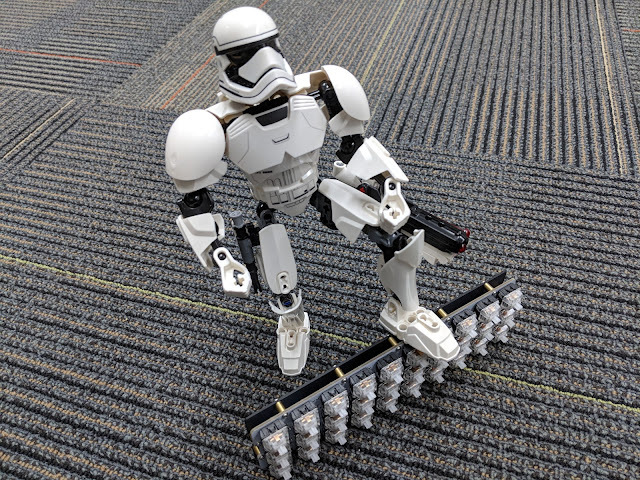 LEGO Star Wars First Order Stormtrooper. 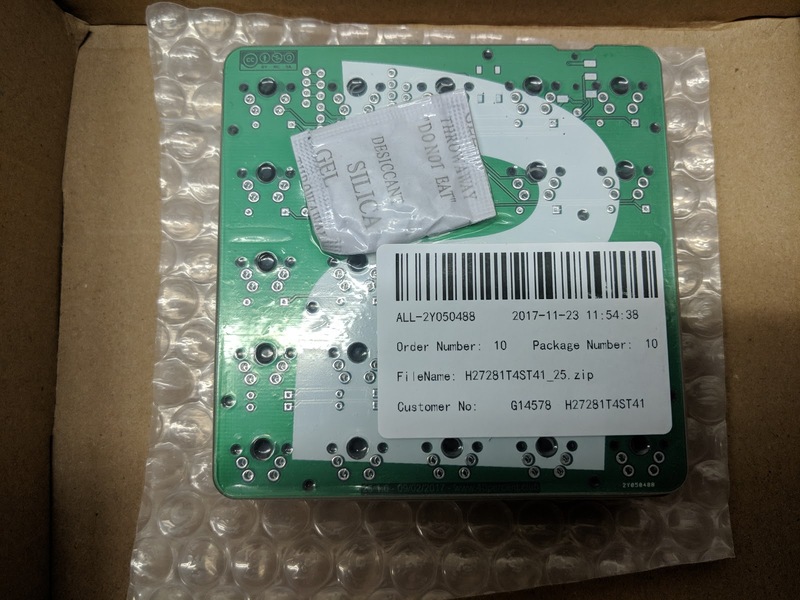 AllPCB is currently having a promotion for ten 100mm x 100mm PCBs for $5 shipped. I ordered some of my 5x5 macropad PCBs. The ordering process is much different than EasyEDA. There is no online preview. It just asks for the size of the board. You have options for different finishes and soldermask colors. There is an actual human that then reviews your design and either accepts it or rejects it. They can either reject it as not producible (errors in design) or add additional charges if you are exceeding the design limits for the base price. The order arrived via DHL. They are definitely losing money doing these orders. The packaging is similar to EasyEDA's. They use a shrink wrap with a bubble wrap layer on the bottom and a clear plastic top. The plastic used is much thicker than EasyEDA's. AllPCB on the left and EasyEDA on the right. Other than the slightly different green color there is no quality difference between the two. 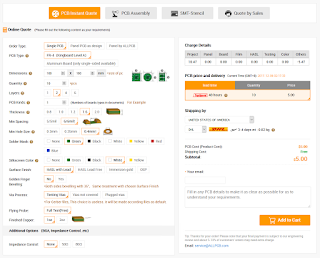 I assembled a set from AllPCB and it works fine. Another Frankenstein 30% Edward Gherkin. Uses the same aluminum plate as this one. This might actually make a good controller for something. 2U POS keycaps from PMK grab bag. These all have double shot defects. The aluminum is bare 5052 alloy. Very strong, but scratches easily. The handles provide some protection for the key caps. Sort of like roll bars. 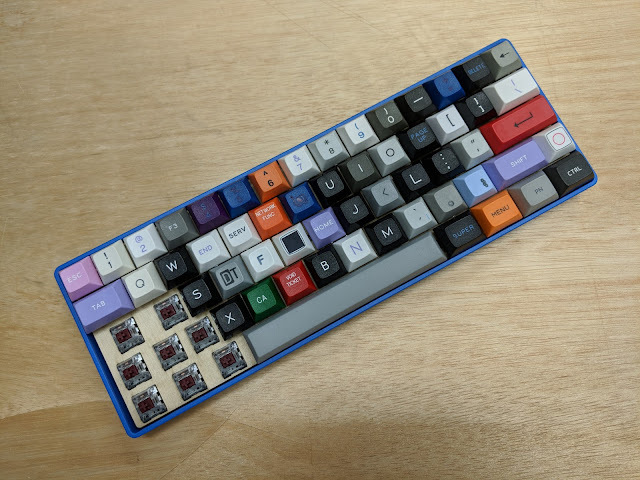 Keycaps are a mix of DSA and DCS profile. The unquadquad with 144 random DSA profile key caps. The PCB has several routing problems and so the matrix does not work without a lot of cutting and jumpering. Will be working on a revised board. Probably remove the reset button since the Adafruit Feather BLE already has one. 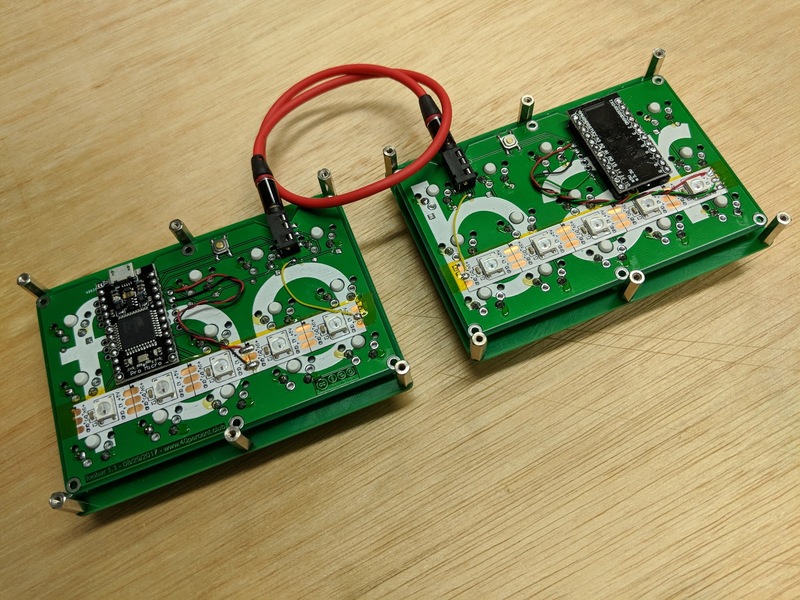 Will look at adding the connector for the battery on the PCB so that a power switch can be added to disconnect it from the Feather when not in use. I will probably remove the LEDs too, probably just add a few status LEDs instead of a full backlight. The LIPO connector is very large on the Feather. Much larger spacers ~14-16mm will be needed even with low profile sockets. Gherkin with perforated aluminum bottom. Same bottom as this one. I had a lot of the same keys in one of my grab bags. 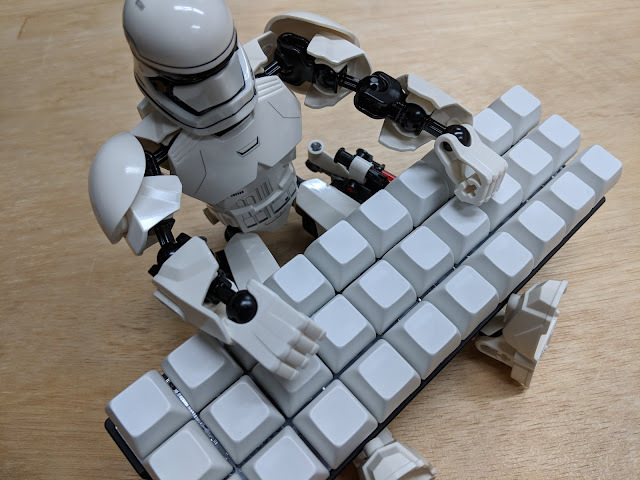 They must have made way too many number row keys. They don't look defective at all. If you Google 0909090909 you actually get quite a few hits. SA Row 3 profile. 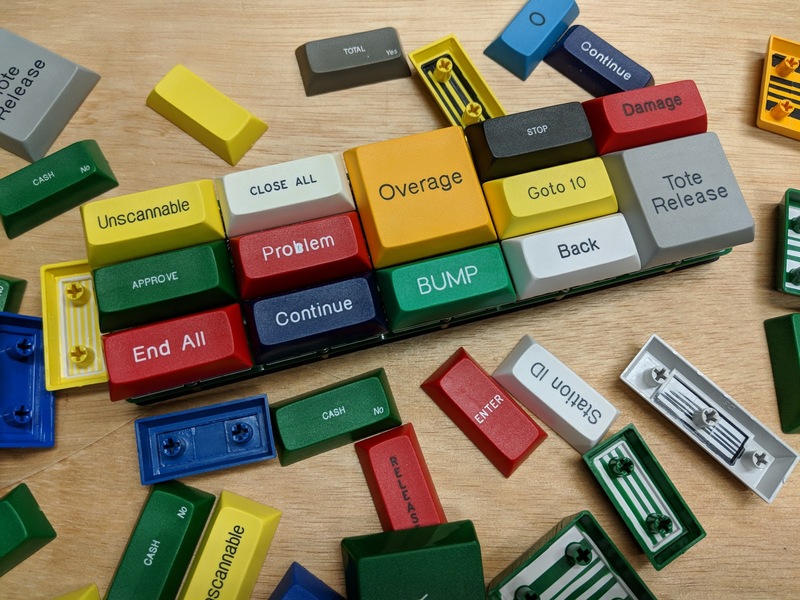 These are grab bag keys from the 1976 keyset. These M2 spacers were really cheap. Something like 500 for $6. They are very poor quality. Some have bad or missing threads. They are really meant to be press fit into plastic holes, where the inconsistencies of length would not matter. 5052 aluminum plate with punched and drilled holes. Some links I found via Google. The "Massdrop" Gherkin. All 2U POS DSA keycaps from PMK grab bags. 30% with only 15 keys. 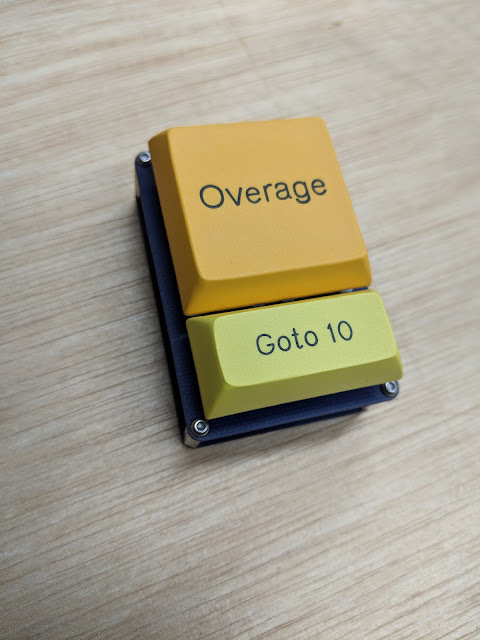 Each POS style key cap covers 2 switches. Soldermask sanded off the bottom, exposing the copper layer. Got a few more Russian diodes from eBay. There is very little documentation available for these. They are popular with retro audio electronics tinkerers. For the purposes of a scanning switch matrix just about any kind of diode will work. I purchased these just for their looks. I removed the colored bands on some in this post. The glass is brittle compared to modern 1n4148 glass diodes. I believe these are D9K, D9J, D2D and D9B. They are all NOS Russian diodes. Another Gherkin using left over parts from the 30% Edward. This one uses the plain PCB top, not sanded or dyed. 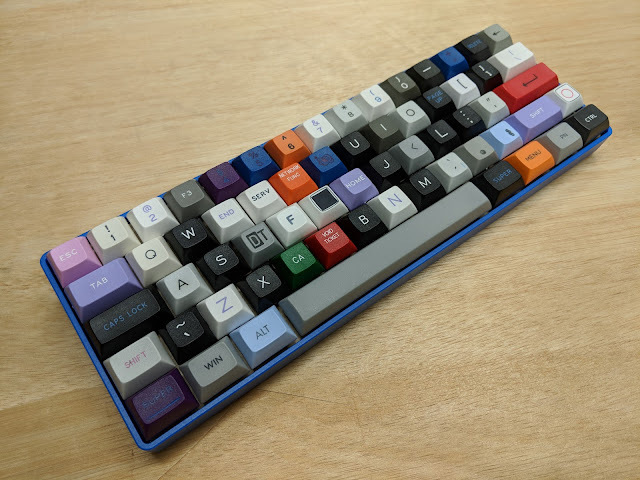 The keycaps are SA profile from a PMK grab bag. The 30% Edward plates have TOMATO on them. These got sanded off on previous version that were dyed. PCB middle pieces. These have white soldemask, but you can't really tell from the side. You can see the supports for the last middle piece through the bottom PCB. These would normally be cut off before being used. Extra thick with 12mm spacers. Same PCB dimensions as the regular MX Gherkin PCB. Cherry ML switches are PCB mount only, the Gherkin top and bottom switch plates are not compatible with this PCB. 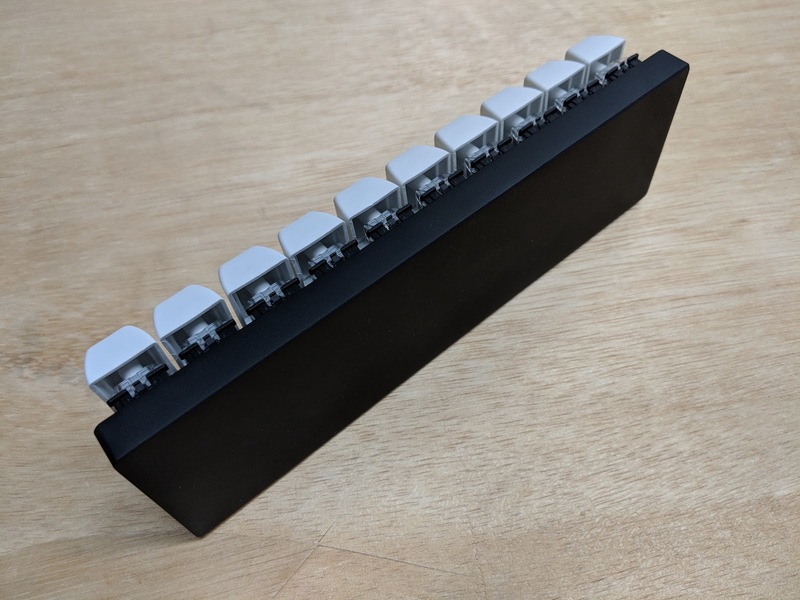 The ML switches are centered and have the same 19.05mm spacing as the MX switches. The matrix is the same as the original Gherkin, it can use the same firmware, there are no LEDs. 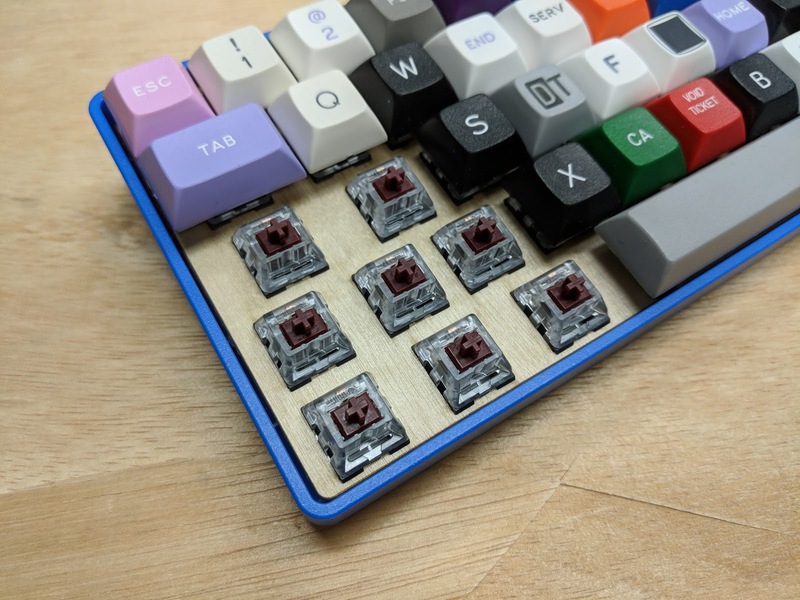 The keycaps and switches were recycled from a PLUM ortholinear keyboard. PLUM keyboards can still be found on eBay. Gerber files are on github. ML switches are very small. Most ML keyboards use 18mm spacing. The Gherkin ML is using the same 19.05mm spacing MX switches use..
Bottom of the PCB with socketed Pro Micro clone. PLUM keycaps. They are ABS with laser legends. 18mm spacing would not work well with these keycaps, they would rub against each other. Side view with 6mm M2 spacers. A second PCB is used as the bottom. It would be possible to use shorter standoffs if you use a very low profile socket for the Pro Micro. Thickness compared to a MX Gherkin built with the same size spacers.